Fun and spooky recipes as well as many witch, skeleton, and ghost-filled surprise activities, games, and craft ideas! Finger puppets, masks, costumes, perpetual calendars, a Halloween-themed banner and picture frame, and tons of photo booth fun await you in the club! 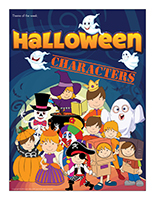 For this theme, we suggest planning a series of special days that will help introduce your group to different Halloween characters. Have fun creating a special Halloween-themed universe each day. 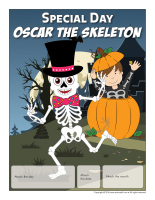 (Open perpetual calendar-Special day-Oscar the skeleton) Print and display the perpetual calendar a few days before your special day to inform and remind parents and children. (Open schedule-Special day-Oscar the skeleton) Print, write your schedule of activities, and display near your daycare entrance for parents to see. (Open costumes-Halloween skeleton) Print and laminate the skeleton parts. Use Velcro to stick them on a black sweater to create a simple skeleton costume. (Open masks-Halloween skeleton) Print the model, glue it on heavy cardboard, and cut it out. Trace it on construction paper for each child and have them cut it out. If you wish, you may laminate the mask prior to having children cut it out. Attach a string or elastic to either side of the mask so children can wear it in front of their face. 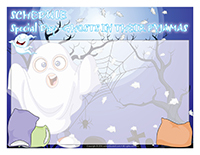 (Open banner-Halloween characters) Print and laminate. Use the banner to decorate your daycare. (Open photo booth-Halloween skeleton) Print the various models, cut them out, and stick them on drinking straws. Purchase a variety of inexpensive accessories in a big-box store or dollar store. Halloween-themed hats, headbands, scarves, glasses, etc. will be great additions to your photo booth. Set everything in one corner of your daycare and hang a large piece of cardboard, a curtain, or any other special background you can think of. Have fun taking pictures of the children in your group. Simply let them choose the accessories they like most and encourage them to have fun making silly faces. If you wish, you may invite parents to participate too. Photograph everyone individually or take family photos. The pictures will make great souvenirs. Print them and display them on a wall within your cloakroom or in a hallway for everyone to see. (Open Skeleton mobile) Print the skeleton parts. Have children glue them on construction paper before cutting them out. Insert fasteners so the skeleton can move its arms, legs, and head. Set a large piece of paper on the floor and have a child lie down on it. Trace the outline of the child's body. Cut out his/her silhouette and display it on a wall. 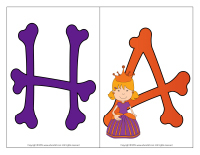 Encourage him/her to color his "skeleton". 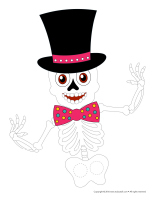 (Open finger puppets-Oscar the skeleton) Print and laminate the puppets. Remember to cut out the holes so children can insert their fingers. They will have fun creating a wide range of scenarios as they manipulate the puppets. Prepare a cold buffet for lunch. Set the food on a black tablecloth. Deposit miniature skeletons here and there on the table. Use store-bought skeletons or make your own using cotton swabs. 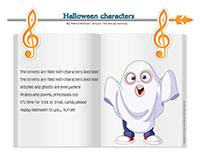 Play Halloween music throughout the meal and turn the lights down. Hang Halloween lights to complete your décor. Add peas five minutes before the end of cooking time. Strain. In a casserole, stir soup, milk, tuna, and half the cheese together. Incorporate cooked noodles and peas. Bake in a 400°F oven for approximately 20 minutes. 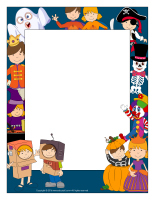 (Open picture frame-Halloween characters) Print. Use the frames to display pictures of your special day within your daycare or to send a souvenir home with children. 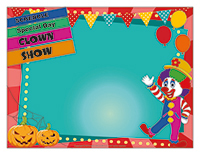 (Open perpetual calendar-Special day-Clown show) Print and display the perpetual calendar a few days before your special day to inform and remind parents and children. (Open schedule-Special day-Clown show) Print, write your schedule of activities, and display near your daycare entrance for parents to see. Fill a basket with clown wigs, white gloves, top hats, red noses, silly pants, oversized shirts, vests, multi-coloured socks, and scarves. (Open clown costume) Print the model, glue it on heavy cardboard, and cut it out. Trace it on construction paper for each child and have them cut it out. If you wish, you may laminate the mask prior to having children cut it out. Attach a string or elastic to either side of the mask so children can wear it in front of their face. (Open photo booth-Clowns) Print the various models, cut them out, and stick them on drinking straws. Purchase a variety of inexpensive accessories in a big-box store or dollar store. Halloween-themed hats, headbands, scarves, glasses, etc. will be great additions to your photo booth. Set everything in one corner of your daycare and hang a large piece of cardboard, a curtain, or any other special background you can think of. Have fun taking pictures of the children in your group. Simply let them choose the accessories they like most and encourage them to have fun making silly faces. If you wish, you may invite parents to participate too. Photograph everyone individually or take family photos. The pictures will make great souvenirs. Print them and display them on a wall within your cloakroom or in a hallway for everyone to see. Prepare a special clown dressing room. Provide colourful hair gel children can use to create silly hairstyles. Also offer makeup, a mirror, and a variety of items that can be used to represent clown costumes. 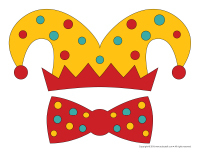 Encourage each child to prepare a short clown show. When they are ready, they can take turns presenting their show in front of the group. Use your parachute to represent a circus tent. Simply hang it from the ceiling within your daycare. Organize several circus-themed workshops throughout the day. Use your hula hoops, tunnels, and jumping ropes to make your little clowns move in a variety of different ways. 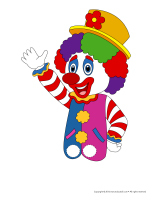 (Open finger puppets-Clowns) Print and laminate the puppets. Remember to cut out the holes so children can insert their fingers. They will have fun creating a wide range of scenarios as they manipulate the puppets. At lunch time, have fun preparing clown pizzas. You will need a small round pizza for each child. Use vegetables to represent clown eyes, a clown nose, and a big clown mouth. Add cooked spaghetti and sauce above each child's pizza to represent a curly wig. For a special snack or dessert, deposit a scoop of ice cream in a bowl for each child. Add an upside down ice cream cone on top of each scoop and let children use candy pieces to create a clown face. 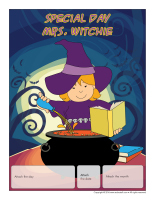 (Open perpetual calendar-Special day-Mrs. Witchie) Print and display the perpetual calendar a few days before your special day to inform and remind parents and children. (Open schedule-Special day-Mrs. Witchie) Print, write your schedule of activities, and display near your daycare entrance for parents to see. Use a piece of black construction paper to make a witch hat. Simply form a cone, glue pieces of yarn around the edge of the hat, and let children decorate it as they wish. To make a witch's broom, glue two empty paper towel rolls end to end. Cut slits in a black garbage bag and wrap it around the base of your cardboard broomstick. (Open masks-witch) Print the model, glue it on heavy cardboard, and cut it out. Trace it on construction paper for each child and have them cut it out. If you wish, you may laminate the mask prior to having children cut it out. Attach a string or elastic to either side of the mask so children can wear it in front of their face. 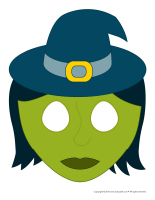 (Open photo booth-Halloween witch) Print the various models, cut them out, and stick them on drinking straws. Purchase a variety of inexpensive accessories in a big-box store or dollar store. 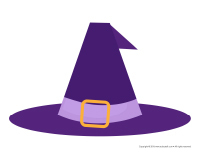 Halloween-themed hats, a witch hat, a long nose, a broom, headbands, scarves, glasses, etc. will be great additions to your photo booth. Set everything in one corner of your daycare and hang a large piece of cardboard, a curtain, or any other special background you can think of. Have fun taking pictures of the children in your group. Simply let them choose the accessories they like most and encourage them to have fun making silly faces. If you wish, you may invite parents to participate too. Photograph everyone individually or take family photos. The pictures will make great souvenirs. Print them and display them on a wall within your cloakroom or in a hallway for everyone to see. Collect several black clothing items. Tie the extremities with rubber bands and stuff the clothing items with newspaper or dead leaves to represent a witch's body. Use a pillowcase to create your witch's head and set a witch hat on top. Encourage your group to name the witch. Throughout the theme, your witch mascot can, for example, play tricks on our group during naptime or before they arrive. 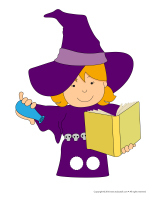 (Open finger puppets-Mrs. Witchie) Print and laminate the puppets. Remember to cut out the holes so children can insert their fingers. They will have fun creating a wide range of scenarios as they manipulate the puppets. Plan a special "black light lunch". Simply replace your regular lightbulbs with black lights and add other Halloween-themed lights to create a special atmosphere. Use white plates and bowls and serve an orange-coloured cocktail. Associate witch-themed names with each food item you serve. Prepare witch stew with your group and serve it for lunch. In a large pot, mix all ingredients together. Reduce heat and remove lid. Continue cooking for 15 more minutes. (Open perpetual calendar-Special day-Ghosts in their pyjamas) Print and display the perpetual calendar a few days before your special day to inform and remind parents and children. (Open schedule-Special day-Ghosts in their pyjamas) Print, write your schedule of activities, and display near your daycare entrance for parents to see. Invite children to wear Halloween-themed pyjamas or, if you prefer, let them wear a white bedsheet over their clothes. Simply cut two holes for their eyes, a nose, and a mouth out of old sheets. (Open masks-Ghost) Print the model, glue it on heavy cardboard, and cut it out. Trace it on construction paper for each child and have them cut it out. If you wish, you may laminate the mask prior to having children cut it out. Attach a string or elastic to either side of the mask so children can wear it in front of their face. (Open photo booth-Ghosts) Print the various models, cut them out, and stick them on drinking straws. Purchase a variety of inexpensive accessories in a big-box store or dollar store. Halloween-themed hats, white bedsheets, tulle, headbands, scarves, glasses, etc. will be great additions to your photo booth. Set everything in one corner of your daycare and hang a large piece of cardboard, a curtain, or any other special background you can think of. Have fun taking pictures of the children in your group. Simply let them choose the accessories they like most and encourage them to have fun making silly faces. If you wish, you may invite parents to participate too. Photograph everyone individually or take family photos. The pictures will make great souvenirs. Print them and display them on a wall within your cloakroom or in a hallway for everyone to see. Let children bring their favorite stuffed animal to daycare. Greet them in your "ghost pyjamas". 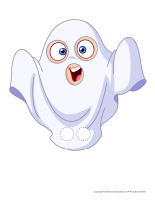 Encourage each child to present his/her stuffed animal to the group and have fun telling ghost stories. 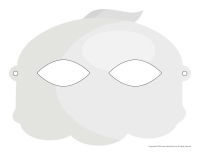 (Open finger puppets-Ghosts) Print and laminate the puppets. Remember to cut out the holes so children can insert their fingers. They will have fun creating a wide range of scenarios as they manipulate the puppets. Serve breakfast for lunch. Organize a special cooking workshop during which you can prepare little ghosts children can enjoy as a snack later in the day. Beat egg whites, sugar, and salt until stiff peaks form. If desired, add one or two drops of food coloring. Using a spoon, drop one spoonful of the mixture at a time on the baking sheet, trying to form ghost-like shapes. Let children decorate the ghosts or decorate them yourself to surprise them. Bake the ghosts in a 200°F oven for one hour. Turn the oven off and let the ghosts cool for another hour. Enjoy! (Open perpetual calendar-Special day-Royal breakfast) Print and display the perpetual calendar a few days before your special day to inform and remind parents and children. 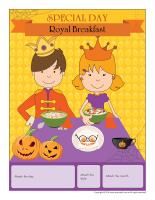 (Open schedule-Special day-Royal breakfast) Print, write your schedule of activities, and display near your daycare entrance for parents to see. Queens can wear lace curtains and drape pieces of different types of fabric over their shoulders. Add necklaces and brooches. Use makeup pencils to draw stars on their cheeks and add glitter. Of course, don't forget to set a crown on their head. For your little kings, cut slits out of black garbage bags to represent capes. Tie a loose knot in each bag so children can easily put the capes on. Add crowns (Open king's and queen's crown) Print the crown model, trace it on cardboard and wrap it with aluminum paper. Let children decorate their crown with shiny accessories. Simply measure the circumference of each child's head and staple their crown accordingly. (Open masks-King and queen) Print the models, glue them on heavy cardboard, and cut them out. Trace a mask on construction paper for each child and have them cut it out. If you wish, you may laminate the masks prior to having children cut them out. Attach a string or elastic to either side of the mask so children can wear it in front of their face. (Open photo booth-Royal family) Print the various models, cut them out, and stick them on drinking straws. Purchase a variety of inexpensive accessories in a big-box store or dollar store. Hats, tulle, headbands, scarves, crowns, glasses, etc. will be great additions to your photo booth. Set everything in one corner of your daycare and hang a large piece of cardboard, a curtain, or any other special background you can think of. Have fun taking pictures of the children in your group. Simply let them choose the accessories they like most and encourage them to have fun making silly faces. If you wish, you may invite parents to participate too. Photograph everyone individually or take family photos. The pictures will make great souvenirs. Print them and display them on a wall within your cloakroom or in a hallway for everyone to see. Organize a special royal breakfast and invite parents to join you between 7:00 a.m. and 9:00 a.m. This will provide parents with a wonderful opportunity to socialize and children will be happy to welcome them in their daycare. After all, parents are kings and queens to their children. 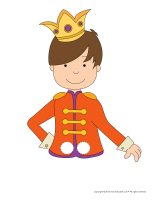 (Open finger puppets-King and queen) Print and laminate the puppets. Remember to cut out the holes so children can insert their fingers. They will have fun creating a wide range of scenarios as they manipulate the puppets. Serve tea (lemonade) and cookies at snack time. You may also choose to serve grape juice in plastic wine glasses along with pretty fruit skewers. Children will love creating edible Froot Loops cereal garlands by sliding the colourful cereal on pieces of licorice. Prepare royal ice cubes by adding a small berry in each section of your ice cube tray before filling it with water and setting it in the freezer. (Open perpetual calendar-Special day-Crafty robot) Print and display the perpetual calendar a few days before your special day to inform and remind parents and children. 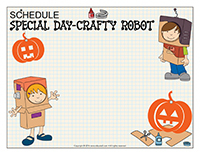 (Open schedule-Special day-Crafty robot) Print, write your schedule of activities, and display near your daycare entrance for parents to see. You will need a cardboard box (big enough for a child to fit inside) for each child. In each box, cut a hole for the child's head and two holes for his/her arms on either side. Wrap the boxes with aluminum paper or paint them using metallic paint. Purchase simple headbands and wrap them with aluminum paper too. Glue aluminum pie plates on either side of each box and use gray makeup pencils to paint each child's face. 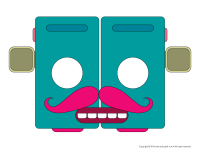 (Open masks-Robot) Print the model, glue it on heavy cardboard, and cut it out. Trace it on construction paper for each child and have them cut it out. If you wish, you may laminate the mask prior to having children cut it out. Attach a string or elastic to either side of the mask so children can wear it in front of their face. (Open photo booth-Robots) Print the various models, cut them out, and stick them on drinking straws. Purchase a variety of inexpensive accessories in a big-box store or dollar store. Metallic hats, headbands, scarves, necklaces, glasses, etc. will be great additions to your photo booth. Set everything in one corner of your daycare and hang a large piece of cardboard, a curtain, or any other special background you can think of. Have fun taking pictures of the children in your group. Simply let them choose the accessories they like most and encourage them to have fun making silly faces. If you wish, you may invite parents to participate too. Photograph everyone individually or take family photos. The pictures will make great souvenirs. Print them and display them on a wall within your cloakroom or in a hallway for everyone to see. At the beginning of the week, give each child's parents a bag containing a variety of recycled materials. Each family must use the contents of their bag to create a robot and bring it to daycare for this special day. Each child can present his/her robot to the group. Collect several cardboard boxes (all sizes). Let children use the boxes to build giant robots. Appliance boxes, shoeboxes, tissue boxes, cereal boxes...they can all be used for this fun activity. Each robot will be different! Provide metal cans, empty toilet paper rolls, aluminum paper, and a variety of other materials children can use to represent a robot. Help them glue the items in place with hot glue. 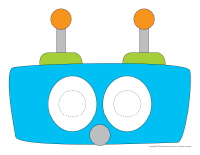 (Open finger puppets-Robots) Print and laminate the puppets. Remember to cut out the holes so children can insert their fingers. They will have fun creating a wide range of scenarios as they manipulate the puppets. Prepare a nuts and bolts soup using fun pasta shapes and chicken broth. Encourage children to drink the broth with a straw and eat the pasta with their hands afterwards. If you wish, you may also prepare a pasta salad. Simply combine fun pasta shapes with tuna or ham and a small quantity of mayonnaise. 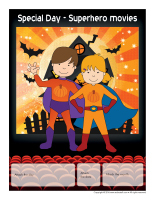 (Open perpetual calendar-Special day-Superhero movies) Print and display the perpetual calendar a few days before your special day to inform and remind parents and children. (Open schedule-Special day-Superhero movies) Print, write your schedule of activities, and display near your daycare entrance for parents to see. Children can wear tights or leggings with an oversized t-shirt. Tie a belt with a shiny buckle around each child's waist or simply glue a cardboard triangle on the front of their sweater. Add a mask or paint each child's face. 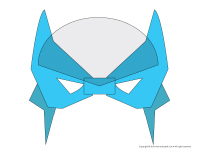 (Open masks-Superheroes) Print the model, glue it on heavy cardboard, and cut it out. Trace it on construction paper for each child and have them cut it out. If you wish, you may laminate the mask prior to having children cut it out. Attach a string or elastic to either side of the mask so children can wear it in front of their face. (Open photo booth-Superheroes) Print the various models, cut them out, and stick them on drinking straws. Purchase a variety of inexpensive accessories in a big-box store or dollar store. Hats, headbands, scarves, necklaces, glasses, etc. will be great additions to your photo booth. Set everything in one corner of your daycare and hang a large piece of cardboard, a curtain, or any other special background you can think of. Have fun taking pictures of the children in your group. Simply let them choose the accessories they like most and encourage them to have fun making silly faces. If you wish, you may invite parents to participate too. Photograph everyone individually or take family photos. The pictures will make great souvenirs. Print them and display them on a wall within your cloakroom or in a hallway for everyone to see. Invite each child to bring a movie starring his/her favorite superhero to daycare. Set up a cozy corner with cushions, blankets, and stuffed animals and play movies all day long. Set up an obstacle course in your backyard. Tie a piece of fabric around each child's shoulders to represent a cape. Have them fly from one obstacle to the next like real superheroes. If possible, set a trampoline at the end of your obstacle course. Children will really feel like they are flying through the air. 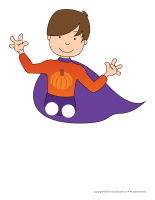 (Open finger puppets-Superheroes) Print and laminate the puppets. Remember to cut out the holes so children can insert their fingers. They will have fun creating a wide range of scenarios as they manipulate the puppets. Ask each child's mother to prepare a special treat for snack time. Children will be proud to share their mother's treat with their friends. If you wish, you may also prepare popcorn, and sweet treats. Serve juice boxes too. (Open perpetual calendar-Special day-Pirate treasure hunt) Print and display the perpetual calendar a few days before your special day to inform and remind parents and children. 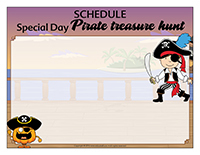 (Open schedule-Special day-Pirate treasure hunt) Print, write your schedule of activities, and display near your daycare entrance for parents to see. 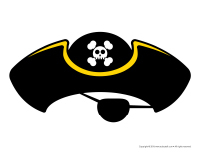 Purchase pirate eye patches and bandanas and hand them out as children arrive. You may also print this model (pirate's eye patch). Tie a piece of colourful fabric on each child's head to represent pirate bandanas. Cut large strips of black fabric and tie them around their waist. 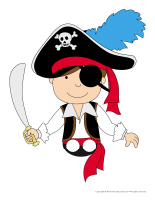 Use the eye patch model available in the educatall club to create an eye patch for each of your little pirates. Simply tie string or elastic on either side so children can easily slide it on and off. Use a black makeup pencil to draw a moustache on each child's face. Older children can do this step themselves. Finally, encourage children to invent unique pirate names. (Open photo booth-Pirates) Print the various models, cut them out, and stick them on drinking straws. Purchase a variety of inexpensive accessories in a big-box store or dollar store. Hats, bandanas, belts, headbands, scarves, necklaces, glasses, etc. will be great additions to your photo booth. Set everything in one corner of your daycare and hang a large piece of cardboard, a curtain, or any other special background you can think of. Have fun taking pictures of the children in your group. Simply let them choose the accessories they like most and encourage them to have fun making silly faces. If you wish, you may invite parents to participate too. Photograph everyone individually or take family photos. The pictures will make great souvenirs. Print them and display them on a wall within your cloakroom or in a hallway for everyone to see. Cut circles out of cardboard and wrap them in aluminum paper. Hide them throughout your daycare and encourage your little pirates to search for them. Cut the top of an empty tissue box to create a treasure chest lid. Decorate the box with tissue paper and glitter. Have children add crumpled pieces of gold tissue paper inside the box to represent gold pieces. They can also paint pebbles with gold paint and add them to their treasure chest. (Open finger puppets-Pirates) Print and laminate the puppets. Remember to cut out the holes so children can insert their fingers. They will have fun creating a wide range of scenarios as they manipulate the puppets. Prepare pirate sandwiches. Simply cut them into triangles and serve them along with veggie sticks. Children can assemble them to create pirate ships. Bake two rectangular chocolate cakes. Spread chocolate icing on both. Arrange them to represent a treasure chest. Add chocolate pieces wrapped in gold paper and candy necklaces inside. Use apple pieces, cheese slices, and toothpicks to create edible pirate ships. The streets are filled with characters boo! boo! Happy Halloween to you... hurrah!